Burlington Jackdaws Under-16s battled back from 2-1 down at half-time to claim a 5-2 home win against Tickton Warriors. Wise words from the watching Bridlington Town striker Jake Day at the break, about being more physical when on the ball, reaped rewards. The home side turned this game on its head with four great moves and goals to see off a Tickton side who battled hard until the end. The hosts took the lead through Bradley O’Connell, but Tickton took advantage of sloppy home play to lead 2-1 at the break. Koppy Pohaoungsavath netted twice after two great assists, followed by a terrific free-kick from skipper Ben Leeson as the hosts took a comfortable 4-2 lead. Brandon Nalton added a fine lob late on. Riley Jemison was the Burlington man of the match. Bridlington Town Under-13s lost out 4-3 at home to leaders Hull Red Stars at Queensgate. Stars won an early free- kick on the left, and the ball was crossed in for a Hull player to have a free header into Brid’s goal to give the visitors a perfect start. Ryan Bemrose made a strong run into the area and crossed the ball to Coby Scotter whose shot was blocked . But the ball fell to Jack Sunley, who also had his effort blocked, the ball fell to Harvey Thompson who made it third time lucky by smashing the ball into the back of the net to level. The scores didn’t stay level for long as Stars took the lead with a shot from the edge of the area, then things got even worse for Town as another shot crept in. The luck seemed to be in the visitors’ favour when Owen Tolson made a good tackle on a Stars player bursting into the box, only for the ball to fall to a Hull player to score from long-range. At 4-1 down things weren’t looking good, but, heading towards half-time, Sunley finally got his reward, firing in from just inside the area after good work from James Langton. The goal in the first half gave Town hope and Scotter had a early chance only for the keeper to rush out and block his effort. 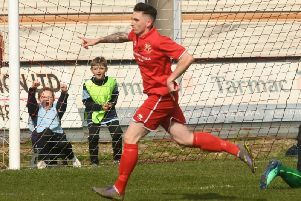 Jorden Martin and Scotter were putting pressure on the away defence to stop them playing out and Brid got another goal back when Thompson fired into the net off the inside of the post. Ben Ward and Spencer Harper in central defence gave Red Stars no clear chances to increase their lead, despite injuries and illness to Brid players during the game they kept pressing. Harvey Asquith had a late half-chance to secure an equaliser, but drastic defending kept him out. The coaches’ man of the match was Chris Leeson, and the parents’ man of the match was Langton. Bridlington Rangers Pumas Under-12s lost out 7-1 after a poor display at Elloughton Blackburn Yellows. Pumas quickly found themselves a goal down, and up against a quick physical team almost all the Brid lads wilted and allowed Yellows to score at regular intervals to go into the break 4-0 down. The hosts added two more goals after the break, then one of the few bright points for Brid came in when Makhaya Widnall linked up with Charlie De’Ath, who finished with a superb right-footed drive angled across the keeper. Elloughton added one more just before full-time to cap an excellent performance.